Great products and the quality is excellent! 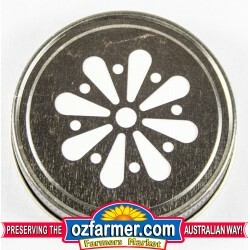 I ordered the black daisy lid for my already owned handled mason drinking jar &amp; WOW! It looks spectacular, I use it with a aluminium straw &amp; it looks very nice. The lid was much better made &amp; presented then I expected. Thank you Ozfarmer's. love these lids. i bought black and white to match the theme of my black and white wedding. they looked fabulous with the mason jars and straws! 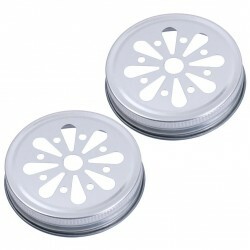 Daisy cut lids, are an attractive lid with a daisy shaped cut out in the lid. These coloured lids come in a range of colours: mix and match from a range of colours. Currently available are black, white, red, green and yellow. They suit all Ball Mason bottles that have the regular mouth including our Mason handle jars (excluding the large 24oz version). Note that the jars in the pictures are for illustrative purposes only and the jar is not included. 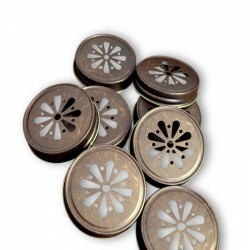 12 x Daisy Lids suits Ball Mason Regular Mouth Jar / Bottle SilverDaisy cut lids, are an attrac..
Ball® Drinking Mason JarsPerfect for parties, home entertaining or as gifts, this Ball® mason jar ..
Get organised for Christmas, Yulefest or for winter comfort food!Available in a a small 1 litre ..